What is the Source of the October 20, 1967 Date? There's a lot of speculation about the timeline for the development of the PGF. I've been thinking about the actual source of that date of October 20th. 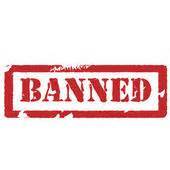 Was it based on the Times-Standard newspaper article? It seems odd to me that the newspaper reporter who received the information about the film and encounter, supposedly around 9:30pm, would have had time to write her article and stop the presses to get this on the front page of Saturdays paper. Knowing how I lose track of the days when I'm vacationing in the 'wild' I have to wonder if Patterson or Gimlin actually knew what day it was for sure. Is it possible that everyone just picked up on the word yesterday in the article published on the 21st and it 'stuck' as having happened on the 20th? It was my understanding they gave the interview on the phone on Friday night Oct 20th. Not sure when the issue then came out. Was there a 'stop the presses' moment? Anyway if they said to the report it just happened a few hours before then that means that 3rd party would be relating it just happened a few hours before on the 20th and the film was on its' way to being developed. What do we know about this issue and what the reporters impressions were about that call if it can be known. Any interviews years later. We also know that there were at least two places who heard the claim of the PGF event 1) the general store and 2) the Ranger station. This is in addition to the reporter. That's one small step backwards for a man....one giant leap backwards, for the BFF. Gee, I might start a thread, asking...."Who Really Shot The Patterson Film?" Sweaty, I think you misunderstand my point. The article written in the Times Standard writes about the event as if it happened Friday, but what if 'last night' was actually Thursday night with the article not getting published until Saturday because the Friday paper had already gone to press by 9:30pm or later. That's why I'm asking if there is another source for the October 20th date, or did everyone just pick up the date from the fact that the article published on Saturday says 'last night'. I think you are misunderstanding my point, Just Curious. Asking what date the film was reportedly shot on is just a ridiculous question to ask. And...it is one giant leap backwards, in the analysis of the film. I'm not going to bother getting into any analysis, regarding this question. It's ridiculous. JC, I get your point and think it’s a valid question. Unfortunately I do not have a good answer or opinion at this time. I’d like to start by reading the article to get a clear understanding of how it’s written. JC this is an excellent thread. In the meanwhile you might want to look up Lawrence 'Skip' Beale and his wife's claims. JustCurious here's page 1 of that first article. It's 11 paragraphs continued onto page 2 if you can search for it. Culled from a 9'30 pm phone call and straight to press just in time. This is the Bigfoot Encounters article about the story Roger related to the reporter with some info added. Here is what it says right under the "Mrs. Bigfoot is Filmed!" title. 2006 Notation: We do know the name of The Times-Standard reporter Roger Patterson contacted the night of October 20, 1967; it was Betty Allen. 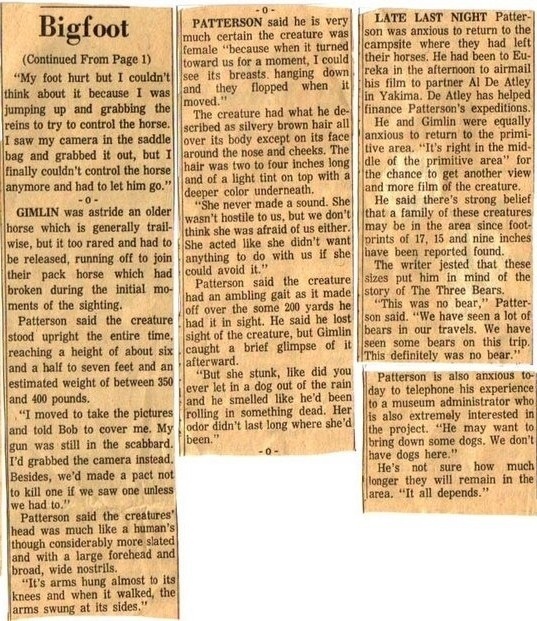 A full account of the Patterson/Gimlin experience was reported in the paper (front page) the next morning, but the reporter did not show his/her name.We DO NOT think this person was Andrew Genzoli (now deceased). Mrs. Genzoli was recently contacted, she said that the article does not appear to be her husband's work. I highly doubt the reporter and the newspaper made a mistake or just could not remember as to the exact date Roger contacted them; especially with a story like that. I would bet if Roger had contacted the reporter on, say the 19th, they would have said "...contacted the night of October 19, 1967". 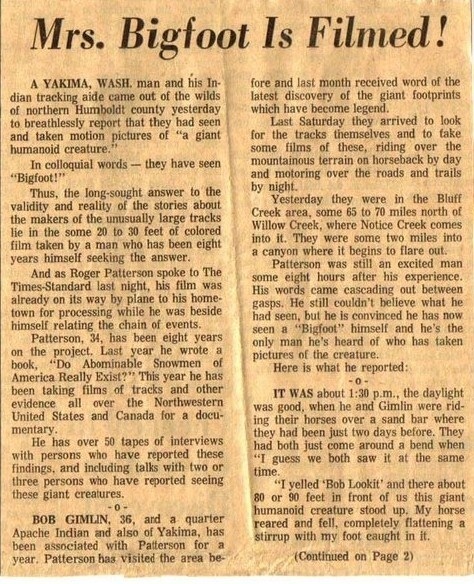 Would that reporter have received so many calls that week from people claiming they encountered and filmed a real Bigfoot that they couldn't keep them all straight. Cool.....now we're finally "getting somewhere", with the PGF. You also have to recognize Al Hodgson as a witness, as they also stopped by an contacted him that Friday. An then you have to recognize they asked Hodgson to contact scientists, Don Abbott of the British Columbia museum, who also notified John Green. Of course DeAtley was notified, but that's a given. So there's more than one source for the date of filmin'. Not sure what this nonsense was for..."Do you know who filmed Patterson's cast footage? I do..." The cartoon has nothin' at all to do with the subject or conversation, I think everyone would agree, however most Natives like myself may find it a tad degradin'...dumb Injun Joe gets tickled off a cliff an his people loose their county. This has to do with the subject how ? 1. Al Hodgson, who met with RP and BG the evening of the 20th. Al H. could have confirmed this and said RP told of an encounter earlier on the 20th,or exposed a lie. 2. Syl McCoy, who was with Al H. when they met RP and BG at the Ranger Station later that night. He could also back up Al H. and anything said at the Ranger Station about an encounter earlier on the 20th. 3. The newspaper reporter and the newspaper. The notation in the paper above the article states the reporter was contacted the night of the 20th. Or was this "fake news", back in 1967. When they're running a story for the Oct. 21st edition, it would make no difference if they got the story on the 20th, or the 19th, or the 18th. Do we have any reason to believe contact with the reporter on the 20th was the wrong date? Has the reporter ever contradicted this? 4. Bob Gimlin would confirm this all happened on the 20th. Now, let's compare this to any evidence that says the date of the 20th is possibly wrong and that another date is correct. What do we have? Do we have any sources or corroboration that everything happened on another date and not the 20th? When you have some corroboration for the 20th and nothing to point to any other date, what is the logical conclusion? I think he has already said, Okie....some 50 years, or so, ago....that the film was shot on the 20th. Gee, I love this thread. It's so.....pointless. You're right; The only thing that was going to happen in this thread was support and some corroboration for the 20th as the date everything happened. And there's a good reason for that. Anyone could bet their last dollar if there was any evidence at all that pointed to things really happened on some date other than the 20th, we would have seen it long before now. There's no way a critic that would be aware of support/corroboration for a date besides the 20th would just sit on it and not reveal it. That's why I sometimes make posts about thinking an idea through; when you do, the idea can start to lose it's luster.